You can purchase a product through the online shop section of our website. After submitting an order, you will be sent an order acknowledgement email with details of the product(s) you have ordered. Please note this email is an acknowledgement only and not an acceptance of your order. All orders placed by you are subject to acceptance by Old Castle Farm Hives. If your order includes products which are not available from stock, we will contact you by email or telephone. You will have the option to wait until the goods are available from stock or to cancel the order. We use trusted and established third party payment companies to process your payment card details for purchases made on this website. These companies are Retail Merchant Services and PayPal. We do not receive any information on the contents of your credit/debit card from the payment companies, just a notification that your payment was approved or declined. We do not receive any information on the contents of your credit/debit card from the payment companies, just a notification that your payment was approved or declined. Your delivery details and chosen products will be collected by the shopping basket system on this website. At the final stages of the checkout process you will be asked to select a ‘Payment Method’, and given a choice of these payment service providers. The payment service providers will collect and process your payment card details on a secure web server to ensure that your payment card details are never compromised. The payment service providers we use provide the highest Levels of security and protection for your payment card. We operate using standard Business Hours Monday to Friday 8am – 5.30pm. We will arrange for your order to be shipped to you generally within 1 – 2 workings days and subject to stock availability. We will notify you if stock is not available, and advise on timings, you may then receive your order in parts but will not incur any additional delivery charges. The precise timing of a delivery cannot be specified, Old Castle Farm Hives shall not be liable or in breach of contract for delay in delivery or failure to make delivery of any goods due to circumstances beyond our control. Once delivered the product ordered will become your property and your responsibility except in relation to products that are damaged or faulty when delivered or incorrectly delivered. We cannot accept any liability for their loss, damage or destruction after they have been delivered. Orders under 2kg are delivered by Royal Mail, orders over 2kg are delivered by courier. Please note that additional charges apply for heavier items including assembled and flat-pack Hives and Invertbee Bee Feed. Please note – surcharges apply to deliveries in the Highlands & Islands of Scotland, Isle of Mann, Isles of Scilly, Northern Ireland and Southern Ireland, the Channel Islands. We will inform you of these when your order is placed, and the difference is to be paid separately please. When possible, we will try to combine your ordered items so that we can reduce the delivery cost, in which case we will contact you and refund as necessary. Collection can be made at Old Castle Farm, Fairyland Road, Tonna, Neath, SA11 3QB, please ring to arrange. Unfortunately, we are unable to accept orders online from outside the United Kingdom so please contact us before buying. All prices shown on our website are in UK Pounds (£). 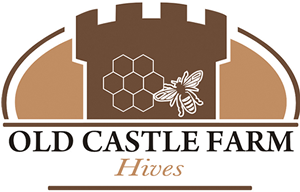 Old Castle Farm Hives are VAT registered, so VAT is payable. Prices may change at any time prior to, but not after, acceptance of your order. We cannot accept your order until you have paid for it in full. Payment can be made securely through our payment service provider by most major credit or debit cards. By using a credit/debit card to pay for your order, you confirm that the card being used is yours. All credit/debit card holders are subject to validation checks and authorisation by the card issuer. If the issuer of your card refuses to authorise payment then we will not accept your order and we will not be liable for any delay or non-delivery and we are not obliged to inform you of the reason for the refusal. We are not responsible for your card issuer or bank charging you as a result of our processing of your credit/debit card payment in accordance with your order. In the unlikely event that the price of an item has been incorrectly advertised on the website, we will contact you by telephone or email. If you are not happy to proceed with the order at the correct price, we will cancel the order. We are not obliged to supply products at the incorrect price. You may cancel your order (or any part of it) at any point before products are delivered to you and up to 14 days afterwards. You may do so either by notifying us by email or writing to us, giving your full name, address and order details, or by returning the product(s). You may not cancel your order if the product has been customised or made to your own specifications unless the products were faulty or damaged when delivered to you. Where you decide to cancel an order after it has been despatched, you will be under a duty to return them to us at your own risk and cost. All such goods should be returned within 14 days of your cancelling the order. Until such time as they are returned you must retain possession of the products and take reasonable care of them. You should return the products to us unused, as new (except to the extent reasonably necessary to examine them), in saleable condition and with the original product packaging. Money will be refunded to the same account debited during purchase, excluding the original delivery cost. We are not liable to pay for any returns postage. Any item returned for exchange will incur an additional delivery charge for the exchanged item to be sent out. Proof of postage should be sufficient evidence of returning goods. Any claims whatsoever of any kind, including shortages, unsatisfactory quality etc, must be notified to Old Castle Farm Hives within 7 days of receipt of goods. The Company warrants that where applicable the goods are at the time of supply within usual tolerances as to quality and finish and will replace or refund (at its option) the price of any goods which do not comply with this warranty to the maximum of the price invoiced for the goods. As the Company is generally unaware of the use to which its goods will be put, all conditions and warranties as to fitness for the purpose whether express or implied and whether arising by statute or common law are excluded. Old Castle Farm Hive’s does not endorse that any of the clothing that is presented or for sale on the website is “Completely Sting Proof” we categorically state that “Virtually Sting Proof” which is interpreted that you can be stung through any or all of our clothing (or any beekeeping clothing) and therefore cannot accept any claims whatsoever of a sting by any form of insect e.g. Bee or any other stinging insect. We need to know your basic personal data in order to fulfil purchases you make from the website, or to respond to your enquiries via contact forms. We will not collect any personal data from you we do not need in order to provide and oversee these services. Forms and shopping carts on the website include consent tick boxes asking for your consent to share this information with us, so the sharing of any personal information will always be done explicitly with your consent and knowledge.